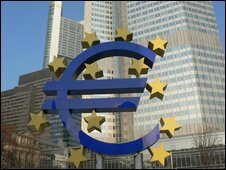 The European Central Bank (ECB) has cut interest rates in the eurozone to a record low of 1%, down from 1.25%. The central bank also agreed a plan to pump about 60bn euros (£53.5bn; $80.6bn) into the eurozone economy by buying up debt. The ECB's UK and US counterparts have taken similar unconventional monetary policy measures to boost growth. It is the seventh time the ECB has lowered its key rate since October 2008, when it stood at 4.25%. ECB president Jean-Claude Trichet said the ECB had decided in principle to buy euro-denominated covered bonds, a safer type of corporate debt, and such purchases would total about 60bn euros. Mr Trichet said more details would be given when the central bank next meets on 4 June. "It's a significant departure from previous ECB policy," Gilles Moec, senior economist at Bank of America - Merrill Lynch, told Bloomberg News. "But other central banks have been a lot more aggressive." Mr Trichet was not clear on how the bond purchases would be funded, but analysts said that the move could pave the way for quantitative easing, which has the same effect as printing money. "Clearly this 'credit easing' could start to open the door for fully fledged quantitative easing from the summer," said Julian Callow, chief European economist at Barclays capital. He also said that the ECB would provide banks with longer-term refinancing and did not rule out lowering rates further. With interest rates already at very low levels the ECB was under intense pressure to come up with some bolder measures to tackle Europe's economic crisis. It has but its policies are still more cautious than those of other major central banks. It is probable the bank intends to start "printing money" to finance the purchase of bonds. But even this is unclear. The ECB hasn't confirmed how it will finance the extra stimulus it giving to the financial system. That will only become known when the ECB announces details of its scheme next month. It has taken a step along the road of quantitative easing pioneered by other central banks, but only a tentative one. "We have not decided today that the new level of our policy rates was the lowest level," Mr Trichet said. But he added that rates were at an appropriate level for now. The ECB said it would lend banks unlimited funds for up to 12 months, up from six months. The ECB's plans bolstered the euro, which rose to a one-month high against the dollar of $1.3420. Mr Trichet also said that the European Investment Bank, the EUs long-term lending bank, would be allowed to gain access to ECB funding by taking part in the central bank's money market operations. The ECB's decision followed the Bank of England's announcement that it would keep interest rates unchanged at 0.5%. The Bank of England also said it would pump an extra £50bn ($75.5bn; 56.5bn euros) into the UK economy by buying government and corporate debt, extending its planned spending to £125bn. Unlike the US and the UK, the ECB cannot buy European government debt because it would have implications for the deficits of individual countries and thus go against the ECB constitution. Central banks around the world are using more unconventional monetary policy methods to support their economies, with interest rates at record low levels. Several other central banks decided to cut rates on Thursday. Iceland's central cut rates from 15.5% to 13% in its third cut this year. Denmark cut rates from 2% to 1.65% and the Czech central bank cut rates from 1.75% to 1.5%, which was the lowest level since the country was formed by the division of Czechoslovakia in 1993.